【Speed cubes smooth and fast turning】：Smooth surface, feel better. There are 4 concave convex grooves for every section. So the snake puzzles can better position during the rotation process. 【Straight line of the snake cubes】：Please make it a straight line before beginning to play it. The cube's length is about 16.2 inches. Who hasn't played with the Rubik's Cube when he was little (and not so little) ? It hasn't really gone out of style and we can still see it in the toy stores. Its inventor, Ernõ Rubik, also devised another variant not so well known: the Rubik's Snake or Magical Snake or Rubik's Twist. The Rubik's Snake is a toy formed by 24 identical pieces in the form of prisms (right triangles) connected by a simple system of gears that allow them to rotate among themselves to form a multitude of figures. 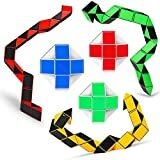 You can find the Rubik's Twist in any bazaar or toy store for just under 20 dollars. And your children will have hours of guaranteed fun with the Rubik's Snake. In theory, you can do thousands of figures with the Rubik's Snake since there are many mathematical combinations. In practice, many are easy and some others more complicated. The best thing, obviously, is to start with the easy ones and continue with the complicated ones as you gain control of the snake and also depending on the age of the child. The most common thing is to make animals, but there are also figures like balls, flowers, swords. Now it's your turn to try and perform each one of them ! Letter: The L indicates a left turn and the D indicates a right turn. Number: Indicates the number of turns to be made of the part, always to the right. I have to admit they are not the easiest when you discover the Rubik's Snake. That being said, a bit of practice should be enough to correctly reproduce your favorite figures and patterns. For example, to make the figure of the cat, the sequence would be: 9R2-9L2-8L2-7R2-6R2-6L2-6L2-5L3-4L2-3R2-2R2-2L2. You can find many more instructions on the Internet. Well, my children have been absolute fans of the Rubik's snake for a couple of years and they wanted to show you some of the figures they know how to make. I don't know how, but they do them, without looking at the internet or anything. Children are like that... A bit of practice and they remember it forever. I find it especially difficult to do "the ball", but I admit that I am rather clumsy with things like the Rubik's Twist (and with many others !). They do it without problems. So, to conclude on the Rubik's Snake, that's another excellent toy from the Rubik's world.